CPT members have continued monitoring Qitoun, Salaymeh and al-Ein Humrah checkpoints each school morning when students are going through the checkpoints to their respective schools. During the first five weeks of the school semester the Israeli border police have been causing regular delays for the students crossing Qitoun checkpoint. The Israeli border police have caused delays to all students as they search boys school bags and checking the teachers’ ID’s. Male adults are being body searched and female adults have their bags checked. The turnstiles are kept closed during any ID check or searches. When the turnstile is re-opened, the border police only allow one person through at a time. Human rights monitors have been subjected to ID checks, and their ID’s photographed on border police’s personal mobiles. 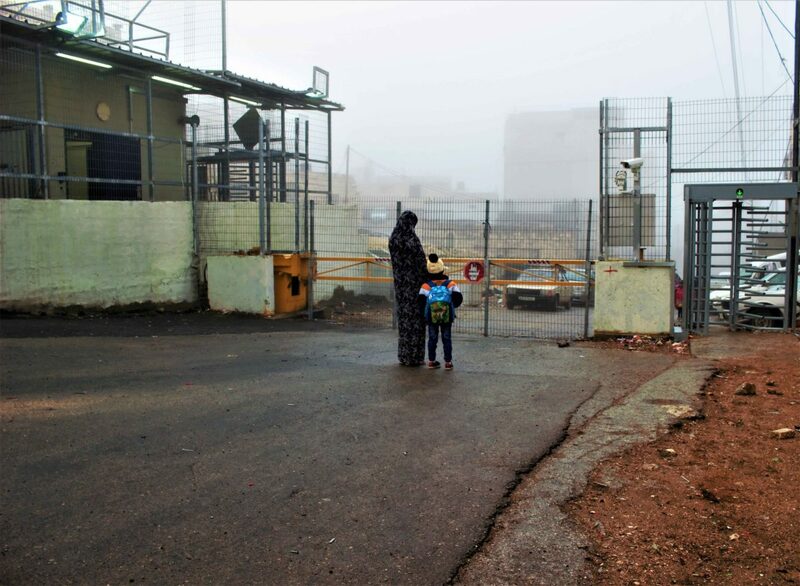 The students, teachers, parents, and other adults passing through Salaymeh checkpoint have been subjected to regular use of force by the Israeli border police. This is becoming more frequent; almost a daily occurrence. 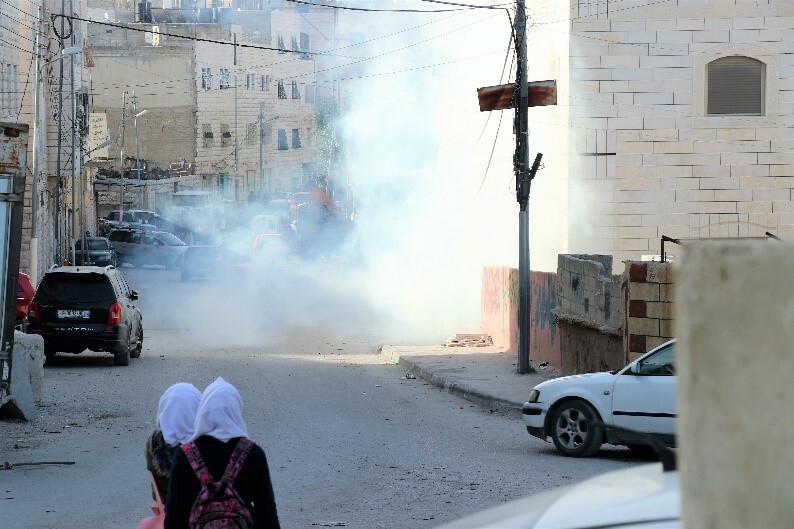 Tear gas canisters have been shot into the schools, resulting in gas inhalation to the point of children and teachers being taken to the hospital, due to excessive inhalation. On one morning CPT counted nine tear gas canisters shot into the boy’s school within in a 15-minute period. CPT members continue to be a supportive presence to the Palestinian communities in the South Hebron Hills. Up until the end of last year members had been spending a night each week in Um al-Khair; at the request of the community, due to the ongoing threat of their homes and structures being demolished. The community of Um al-Khair has not asked for this presence right now but CPT keeps regular communication with the community. At the request of the community, CPT along with other human rights groups helped construct a family home which had been demolished. It was necessary to get the main building completed in a day to avoid Israeli settler or Israeli soldier harassment. Later a greenhouse was also constructed with the assistance other human rights organizations. 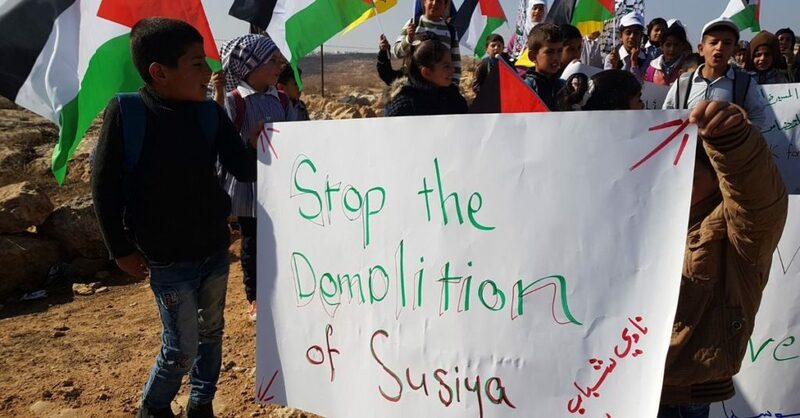 The Bedouin village of Susiya has been under threat of immediate demolition for the last few months. The official order for the demolition of fourteen houses, the school, the health clinic and the solar panels donated by EU countries was received in December 2017. However, due to appeals made both by the local people, as well as some foreign delegations, and the lawyer, the demolition has not yet taken place. For the time being, CPT will be spending one night a week in Susiya. During the past months, many demonstrations have been held in al-Khalil. In December after the announcement by the USA administration, that they recognize Jerusalem as the capital of Israel, protests were held daily throughout Palestine. In February 2018, multiple demonstrations were held each week for the anniversary of the al-Ibrahimi Mosque massacre. After nonviolent demonstrations, Israeli soldiers would advance into the Palestinian neighbourhoods trying to disperse the crowd, indiscriminately shooting sound grenades, rubber coated metal bullets, tear gas canisters and at times, live ammunition. Many arrests were made especially of young male adults and teenage children. 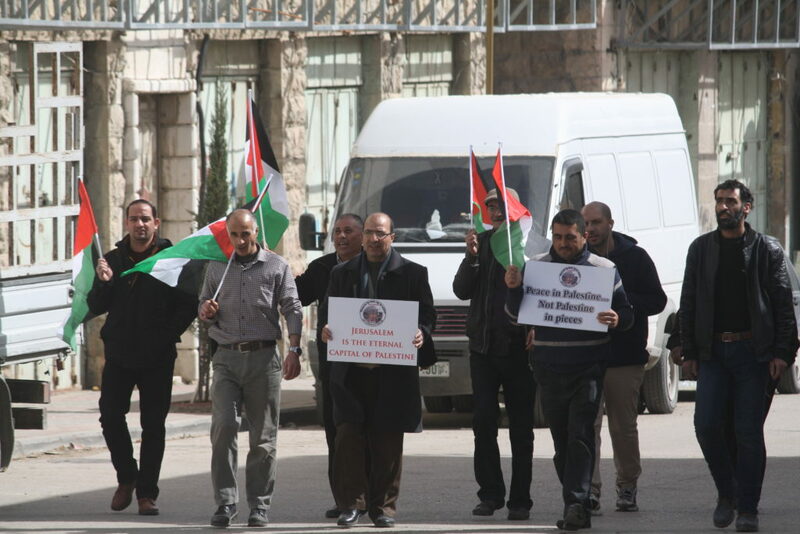 As always, other protests were held throughout the last six months, such as protests held for the political prisoners in Israeli military prison. Demonstrations are by different organizations in al-Khalil; Hebron Defense Committee, Human Rights Defenders and Youth Against Settlements. CPT members were present at all demonstrations to document and monitor the human rights violations. The Israeli Occupying Forces arrived at the Jaber family’s home on the morning of 21st February 2018, with two bulldozers and ten workers from a private company. They destroyed the water cistern that was used to save rain water and uprooted about 150 trees planted during the past fifteen years. These included olives, figs, grapes, almonds and other types of trees. They also destroyed many vegetables that were ready for the market, and the irrigation pipes connected to the cistern. The Jaber family have lived on their land, in the Baqa’Valley, long before 1948, but the IOF claimed that the cistern was built without a permit and the trees were illegally planted on state land. After the Israeli forces left the Baqa’Valey, they went to Beit Einoon where they destroyed a blacksmith’s workshop located in a tent structure for the second time within the last three months. On the morning of 6th March 2018, Israeli settlers accompanied by the Israeli Occupying Forces started a new illegal outpost in the area of Beit Einoon, north east of al-Khalil. They put up a sign giving the area a Hebrew name, “Havat Mesareve” and planted Israeli flags. Later in the day Israeli civil administration officers arrived with more IOF soldiers and border police, and four trucks carrying big housing caravans which were installed later by cranes. The land is owned by the Palestinian Aidade family but claimed by the settlers to be state land. The settlers had earlier, on 7th February 2018, bulldozed seven dunums of the family owned land of 60 dunums, in preparation to start an outpost. On 18th February the IOF arrested 17 members of the Aidade family while they were planting olive trees in the land. The family were accused of attacking the Israeli settlers. However, it was the Israeli settlers who disturbed the family while they were trying to plant the trees. All but two of the Palestinians were released later that day. The other two Palestinians were detained for two days and released on bail of a thousand shekels each. The settlers later uprooted the olive trees. CPT sends its condolences to the family of Mahmoud Zain al-Jabar who was murdered by Israeli forces on Friday the 9th off March in the Bab iZaweyeh area of al-Khalil. Shot three times by the Israeli forces, Mahmoud died not long after. Mahmoud leaves behind his family, a wife and a young child. CPT members continue to maintain regular communication with the community in al-Khalil and the South Hebron Hills. Our many partners continue to be invaluable to the work here. CPT is constantly looking at new ways to continue to engage with the community, so that we can connect with more families in the old city, and other areas of al-Khalil.